The Great Bustard Otis tarda is one of the heaviest flying birds in the world. Indeed, it may well be the heaviest of all as some males can be 25 kilos. It is an Old World species that typically lives on lowland, dry grasslands (as well as on suitable farmland) ranging from the Iberian Peninsula eastwards to China. Once found over most of lowland Europe it's range decreased steadily for many years and today it is absent from most countries with the strongholds being Spain and Hungary. Good numbers are still found in Russia and the Ukraine, too. 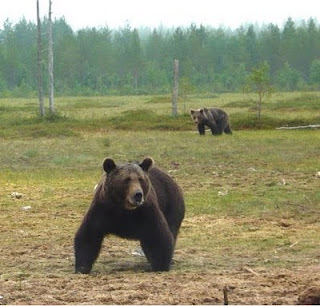 In Europe Brown Bears Ursus arctos are found mainly in the east, in parts of Scandinavia, eastern Finland, the Baltic States, Poland, Slovakia, and uplands in the Balkan countries. Further east still Russia has good numbers and indeed its range spreads east as far as Kamchatka. Small numbers also reside in mountains in Spain and Italy. But they are wary animals and never easy to find without local knowledge. Indeed, most tourists in Europe see bears by joining organised tours and visiting bear-watching hides. Brown Bear is the largest and most powerful carnivore in Europe and should never be taken for granted if encountered. In North America, where it is known as Grizzly Bear, it is not uncommon in wilderness areas. 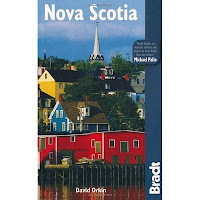 This new guide to Nova Scotia by David Orkin covers everything one needs to know about Canada's second smallest province. For those of us interested in wildlife, there is a 7-page section on Natural History which includes Flora, Fauna, Reptiles and Amphibians, Birds (with Notable Birding Sites), Marine Wildlife (with a paragraph on "Seal Bashing"), National Parks and Conservation. Elsewhere in the book whale-watching, wilderness areas and hiking are covered. Wildlife photos are dotted through the book and include Bald Eagle, White-tailed Deer, Grey Seal, Moose and Lynx. Though this 392-page colourful book, in the Bradt Travel Guide series, is a general guidebook, it covers enough wildlife subjects to make it well-worth getting hold of in advance of any trip to Nova Scotia. Mollem National Park lies in the Western Ghats hills in the east of Goa State, India. It is the core of the Bhagwan Mahavir Wildlife Sanctuary and covers some 107 sq km and is covered by both dry and wet forests. Highway 4a cuts through the park and provides easy access. Goa Airport is just 80km away to the west. The area can be explored on a series of marked trails. Mammals include Leopard, Leopard Cat, Jungle Cat, Civet, various deer, Porcupine, Bonnet Macaque, Black-faced Langur, Malabar Giant Squirrel and Pangolin. Snakes include King Cobra, though you will be lucky to see one. Birds abound with some of the more spectacular being Malabar Pied Hornbill, Great Indian Hornbill, Paradise Flycatcher and various drongos, barbets, woodpecker and kingfishers. The best time to visit is from October to April, outside the monsoon season. This birding lodge is situated in the Bhagwan Mahaveer Wildlife Sanctuary in the Western Ghats hills in Goa State. Backwoods is comfortable but not for those who like full-on comfort. It is rather a place for those who want to sleep in the heart of the forest and for who nature, particularly birds, are the focus. There are six tents, six cabins and two rooms in a main building. The food, often curries, is really authentic and cooked by locals using local produce. With resident frogmouths, sunbirds, nightjars, owls, kingfishers and woodpeckers, as well as often confiding Black-faced Langurs and Bonnet Maquets, the photographic opportunities are very good, too. Stays at Backwoods are fully guided and the resident guides know where the birds are. All in all, the camp is run by birders for birders. Visit outside the wet season, from November to March.